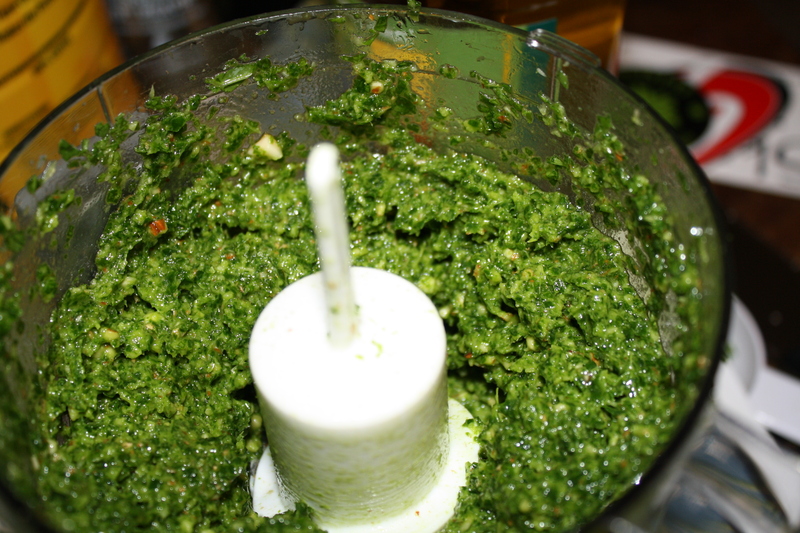 I used to think there was no such thing as “too much garlic.” Then I made this kale pesto. 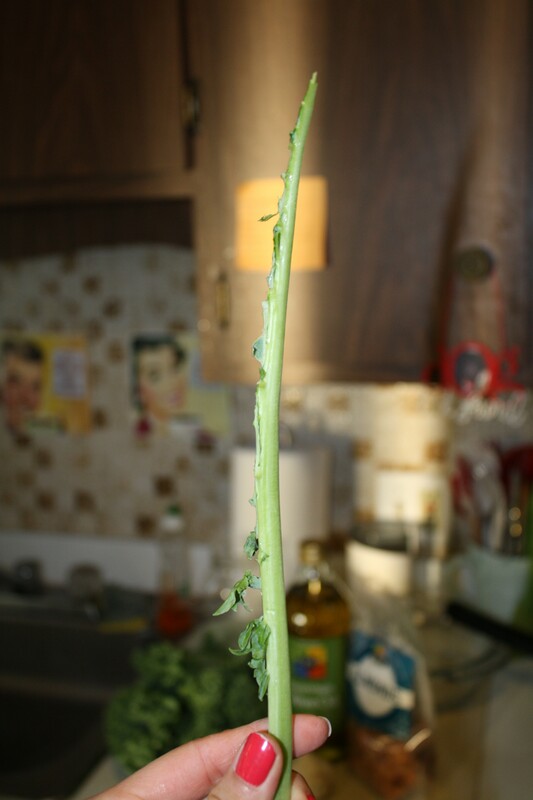 First, you must de stem the kale. I do this by grasping the stem between my thumb and forefinger and sliding my fingers down the stem to pull the leaf off. 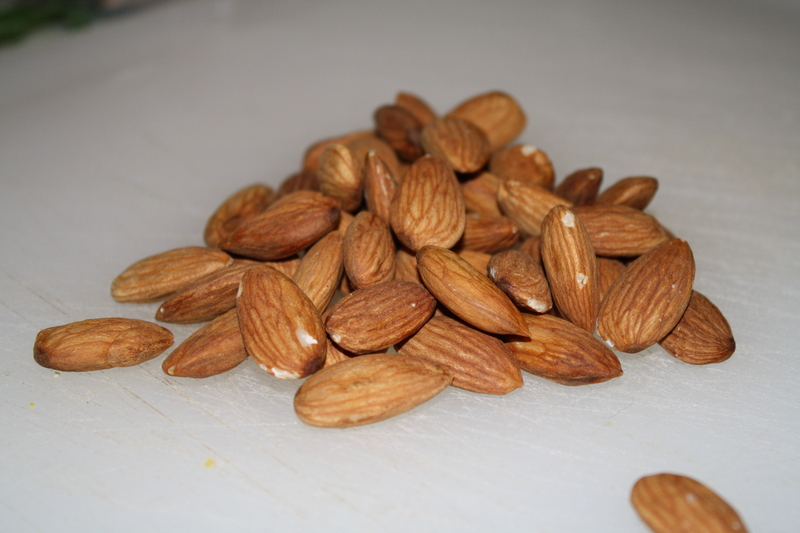 The next thing I did was pre-chopped my almonds to make things easier on my tiny food processor. and process until it takes on a pesto consistency. 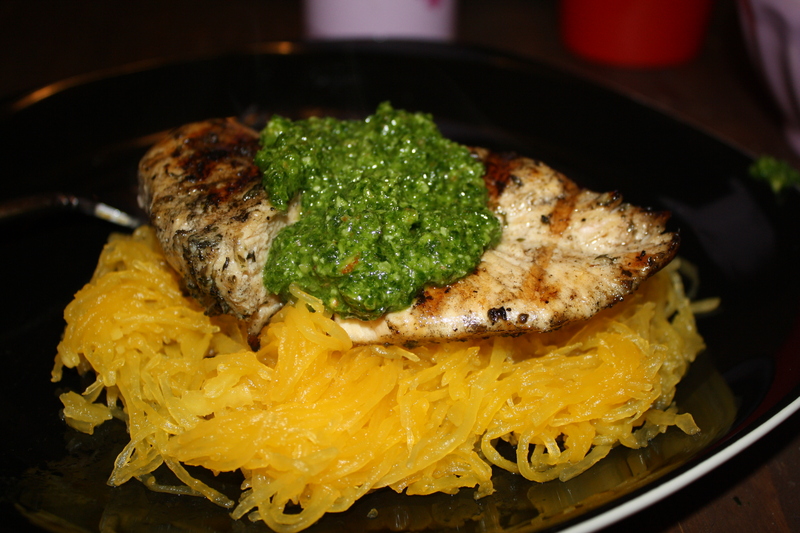 We decided to have our pesto with grilled chicken and spaghetti squash. 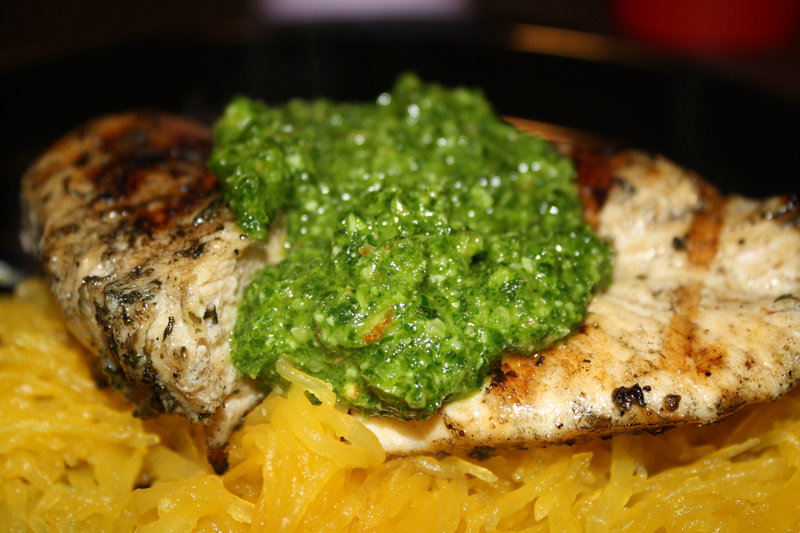 Chicken with pesto is one of my favorite food combos! 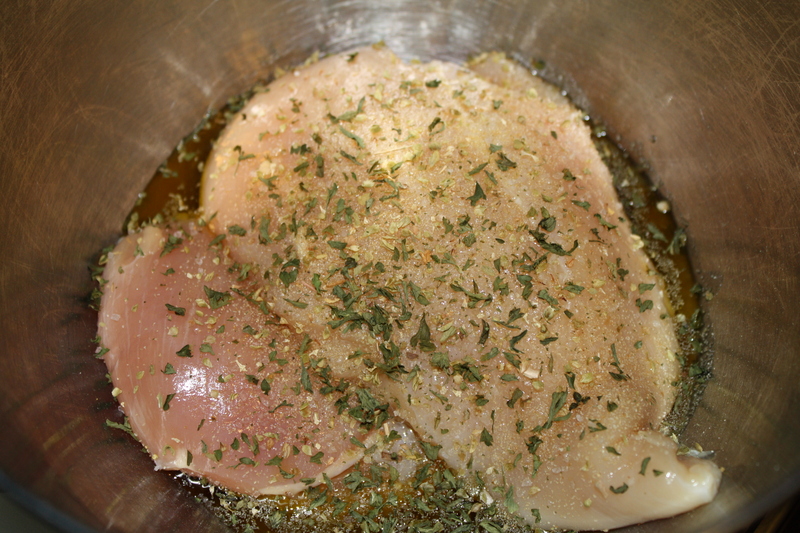 I rubbed the chicken in sea salt, oregano, garlic powder, dried parsley and olive oil and M tossed it on the grill. 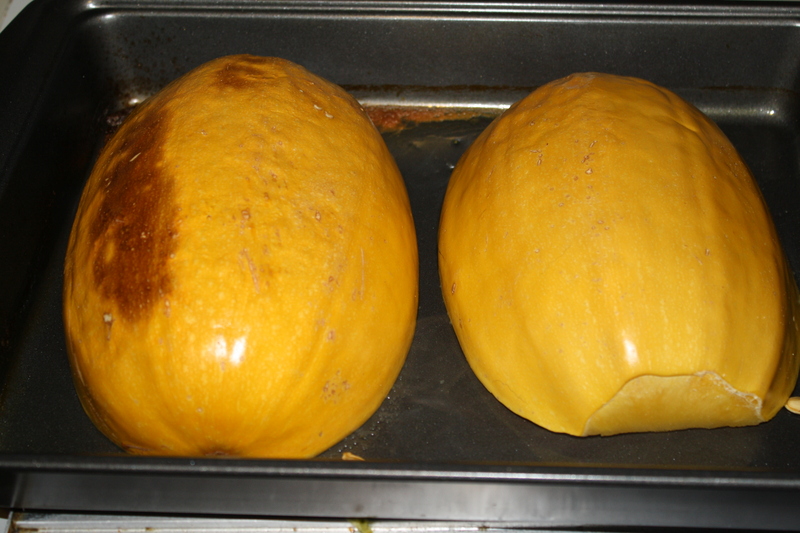 We baked a giant “fun Squash” as our pasta substitute. 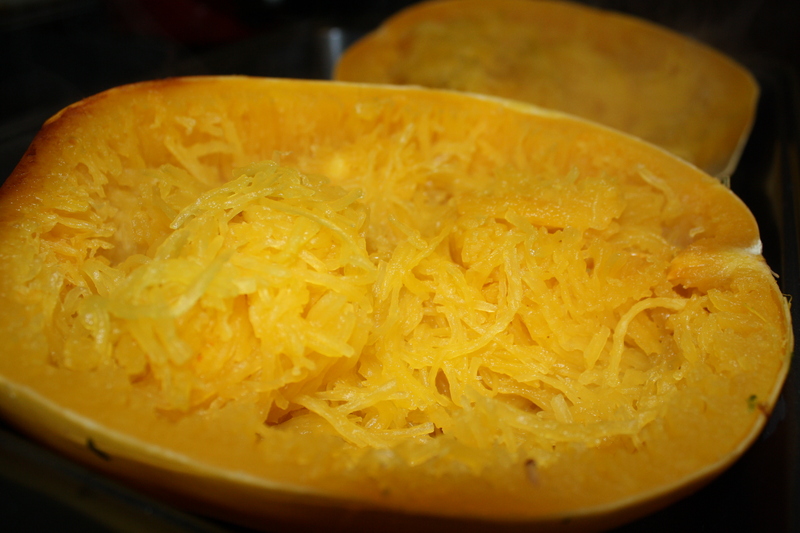 Spaghetti squash is quickly becoming one of my favorite squashes. So the pesto was SUPER garlicky. 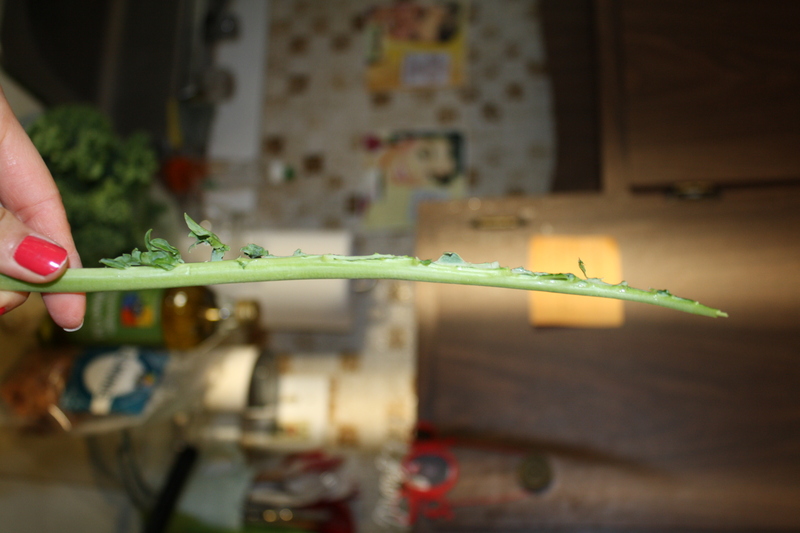 It had a real bite to it…I think it was partially the garlic, and partially the bite-y nature of curly kale. If you decided to make this pesto, add garlic with caution. I would recommend adding one or two cloves, and then doing a taste test…you might only need two! 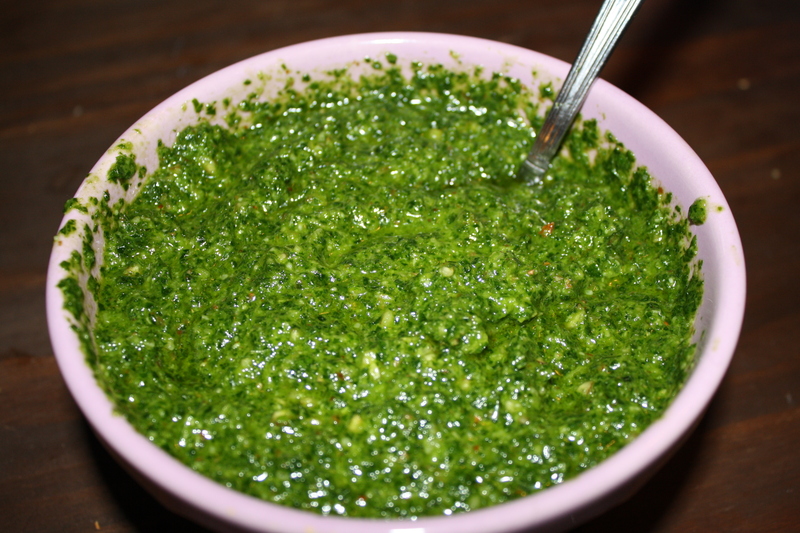 While I definitely prefer basil pesto, the kale pesto wasn’t half bad! 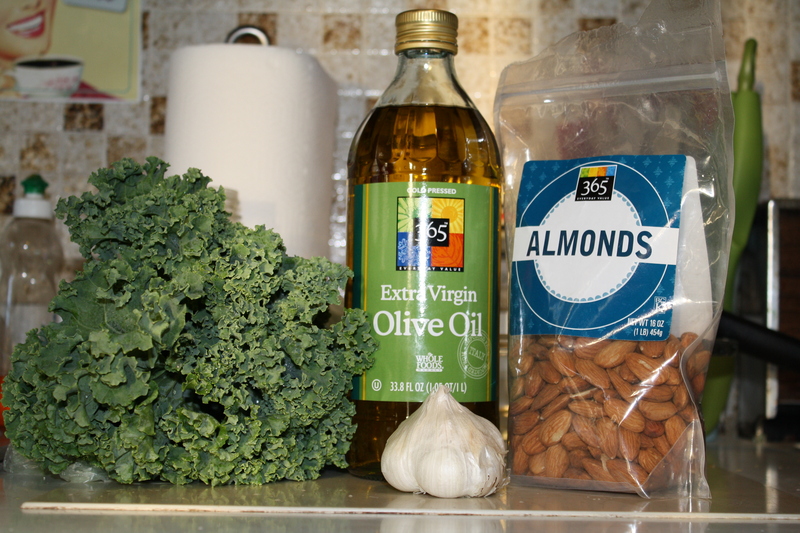 I would make it again…with less garlic…I’ve learned my garlicky lesson! 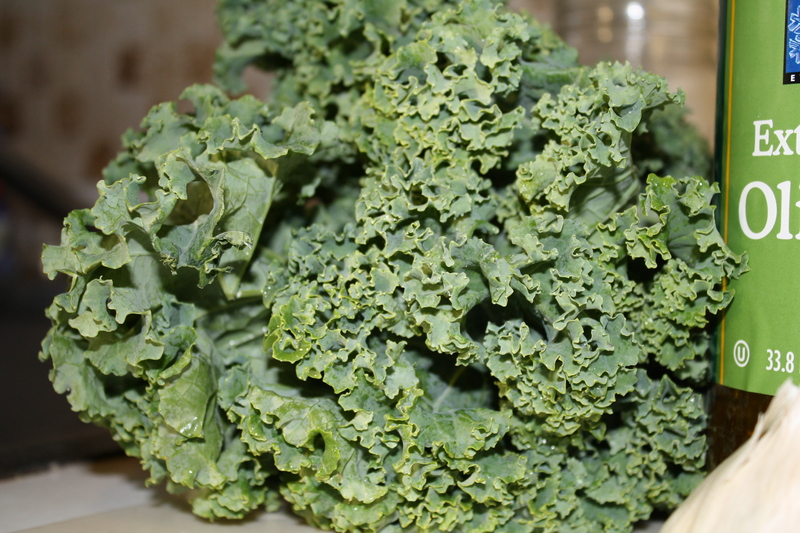 I have some kale in my fridge right now, and I wasn’t sure what I was going to use it for. Well, I’m definitely going to make this it looks really good. I’ve never tried that type of squash before, but my mom loves it, so I’m going to give it a try. Looks great. I love spaghetti squash! I was hesitant to try it too–squash always seems like so much work– but this is SO easy! Let me know how it gos! What a clever idea! I love the taste of fresh basil, but for some unknown reason, it nauseates me terribly quickly after I start eating it. Major food intolerance I guess. Few things do this to me. 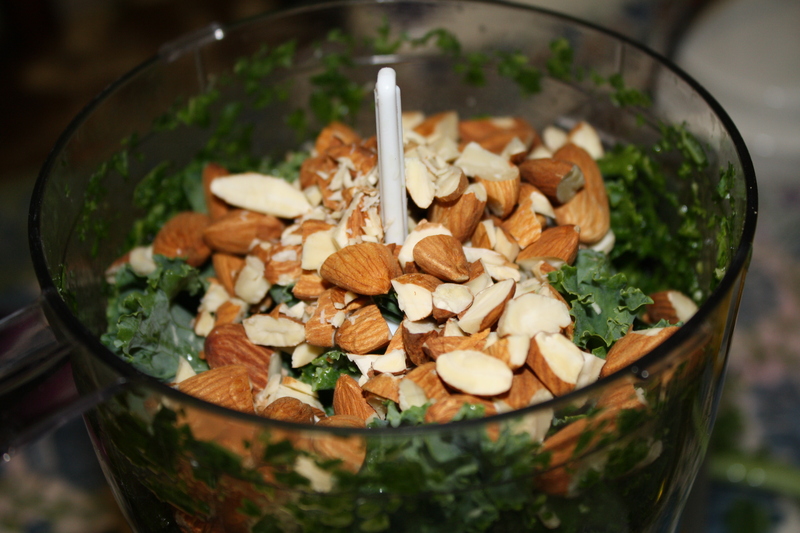 But I love kale and am looking forward to trying this! What a nice sub for real pesto in recipes! I’m so glad you’re going to give this recipe a try! I’m interested to hear how it goes for you! This look delicious! I am one of those people who thinks you can never have to much garlic, so I will definitely give this a go with lots of garlic! I’ve always wanted to try spaghetti squash so I may make some with the pesto and some grilled salmon. Great recipe, thanks for sharing these great photos!